I remember a friend of mine who had earned his PhD at the University of California once saying that he thought Lafayette was more tolerant than Berkeley. That seemed unlikely to me, so I asked a mutual friend, another scholar who read constantly about politics and social issues, and who also traveled widely. “Certainly,” she said. There’s the rub. Because (perhaps) liberals tend to be more tolerant, there is this misconception that tolerance is liberalism. It’s not. Look at the word: ‘tolerance’ does not mean to accept someone, to like them, nor to support them. It simply means to tolerate them. The Dutch are very conservative, but tolerant. (They were too tolerant for the Pilgrims, who left Amsterdam in disgust and came to America to avoid such open-minded heretics.) The Cajuns and Creoles tend to be tolerant as well. In fact, the Acadians were unique among American colonists, living in peace among the Mi’kmaq natives, and even intermarrying with them. When the English began deporting the Acadians in 1755, the ties between the two groups were so strong that many of the Mi’kmaq protected and hid the Acadians. But the Cajuns are nevertheless conservative, and have become more so in recent years. When moderate Democrat Kathleen Blanco was elected governor of Louisiana in 2003, she did not carry her own home parish of Lafayette. A much-beloved and influential local teacher and artist, the late Elemore Morgan, Jr., once told me a great anecdote about tolerance. He described how one time he was trying to get some of the locals involved with a project he was working on. In an impassioned speech, he gave them his best arguments . But what should we ask for, beyond tolerance? I think if we spoke to most persecuted minorities, they would be quite happy with tolerance; being liked or accepted would be nice, but hardly critical. What most us want, minority or otherwise, is to simply be allowed to live our lives in peace. Beyond that, I find a personal reason to defend tolerance. I dislike people for all sorts of reasons, some of them quite petty: I don’t like the way they look, or talk, or act. (Someone pointed out to me that we don’t like people who remind us of ourselves. Don’t start.) I want the right to like or dislike, and to befriend or avoid, whomever I choose. How can I then deny the tolerant bigot the same privilege? If you look back at the previous post, that was the problem we explored. It wasn’t that Hitler was an anti-Semite, nor that Mao & Stalin adamantly rejected capitalism and religion. What made them intolerable was, well, intolerance. That’s the logical puzzle we face, we must be intolerant of intolerance. That sounds confusing (and it is), but I suspect it is the basis of our laws; as Oliver Wendell Holmes said, “The right to swing my fist ends where the other man’s nose begins.”1)For a discussion of the origins of the quote, click here. Holmes was one of our greatest jurists, and perhaps not coincidentally he was a Unitarian, a member of an extremely tolerant religion. Intolerance of intolerance: personal freedom must be limited by the freedom of others. When we knowingly encroach on the freedoms of others, that reflects and intolerance of them or their rights, and it interferes with the community. And when an intolerance of intolerance is not the basis of law, it is often because the legislation itself reflects a certain intolerance of one group for another. As we go through these essays I will argue, over and over, that tolerance is the essential first step to discussion, cooperation, and progress. If you enjoyed this, please subscribe to Bookscrounger.com on any page. 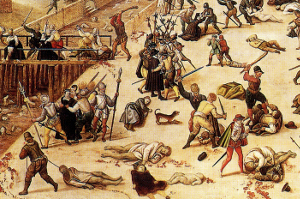 First picture, detail from the St. Bartholomews’ Day Massacre, courtesy of Wikipedia.org. In the massacre anywhere from 2,000 to 70,000 Protestants were killed by Roman Catholics over several days. Of course it was Protestants killing Catholics in another time and another place. It has been that way since Cain slew Abel. Second picture courtesy of The Knights Templar. If you click the link, you will see that the Knights are quite conservative on some positions, and attack liberals for their intolerance. The Knights make some interesting points. 1. ↑ For a discussion of the origins of the quote, click here. As a card carrying member of the “out” group, “intolerance” is often on my mind. My own personal continuum ranges from mindless intolerance of dirty dishes left in the left hand sink where the garbage disposer resides (as if it’s some sort of totem that will magically clean them via proximity) to very consciously cultivated intolerance of people who should “know better” or who deny others’ rights they freely expect for themselves. Nietzsche’s admonition about fighting monsters is always present in the near recesses of my mind and there have certainly been times that I’ve misread or misjudged my target — which can be an extremely unpleasant place to find oneself.